In health care systems with a competitive health insurance market sufficiently price-elastic demand is important for motivating health insurers to act as cost-conscious purchasing agents on behalf of their customers. A recent systematic review of empirical studies on price elasticity of health plan choice identified clear-cut price elasticity ranges for different country settings but substantial variation in price elasticities across various countries . For the Netherlands, where competition among health insurers was introduced within the social health insurance (SHI) scheme in 1996, the review study found short-term price elasticities smaller than −0.5, which were well below most of those found in other countries.1 As noticed by Pendzialek et al. 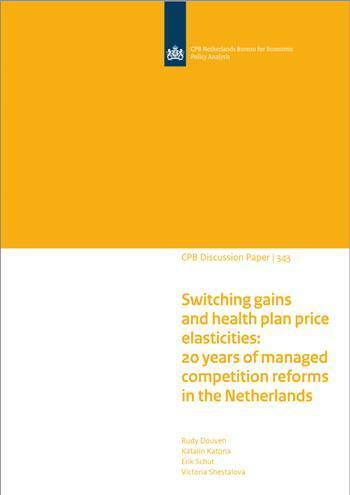 , however, evidence about the Netherlands is dated, since the empirical studies only relate to the situation before a major health insurance reform in 2006, and almost no information could be found on price elasticities in the years following the reform. This limitation is particularly troublesome because the primary goal of the reform was to enhance consumer choice and competition in order to reinforce insurers’ incentives to improve the efficiency of care. The main contribution of this paper is to fill this gap in the empirical literature by estimating the price elasticity of health plan choice in the Netherlands after the major reform in 2006. Using data on prices and market shares of all health plans over the period 2005-2015, we examine whether price elasticities of health plan choice increased relative to the low price elasticities prior to the reform. For a good comparison between the two periods, we re-estimated the price elasticities for the entire pre-reform period 1995-2005. This is because previous empirical studies use different methodologies and typically cover only part of the pre-reform period. As noticed by Pendzialek et al. , health plan price elasticities are difficult to compare because of the differences in methodologies and data sources of the included studies. Therefore, a second important contribution is that we provide consistent estimates of health plan price elasticities using the same methodology and data over a twenty years’ period. We are not aware of any other study that consistently estimated annual health plan choice over such a long period.2 Third, we contribute to the literature by also calculating the annual net financial switching gains for consumers over a twenty years’ period, uncovering also the sources of these gains. This provides a unique indication about the extent to which consumers financially benefited from switching and how these benefits changed over time. Therefore, our findings may offer important insights for health policy on how to influence consumer choice and price competition in health insurance markets. Our paper is organised as follows. In section 2 we describe the main differences between the pre- reform and the post-reform health insurance market in the Netherlands. Section 3 discusses the financial switching gains for premium payers. Section 4 explains the estimation methods and empirical strategy. In section 5 we describe the data and in section 6 the estimation results. Section 7 concludes.